Hazardous air quality caused by the wildfires still burning in Northern and Southern California have forced schools and universities to close throughout the state, and education officials are stepping in to provide a range of supports as nearly two dozen counties have been affected. Dozens of schools across San Francisco and the surrounding areas closed Friday because of unhealthy air caused by the Camp Fire, California’s deadliest fire ever. Others canceled outdoor activities. Many of the schools already planned to close this week for the Thanksgiving holiday, SFgate.com reported, but at least one school district, Albany Unified, reopened Monday. 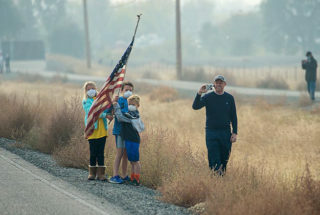 The fires have canceled class for as many as 1.1 million K-12 students, according to an analysis by CALmatters, a nonprofit California news website. The state reports that schools have had to close in 22 counties. Colleges and universities have also canceled classes because of air quality concerns. At least three school districts in Southern California canceled class last week because of the Woolsey Fire, which is still burning in Ventura County but is expected to be fully contained by Thursday. The half-million students of Los Angeles Unified are on break all Thanksgiving week. Malibu schools will remain closed through Thanksgiving, as the area is still under evacuation orders. A doctor in the Bay Area told ABC7 News he’s seen twice as many children having trouble breathing, likely caused by smoke blowing into the region from the Camp Fire. “When they are running, or laughing, if that’s triggering a cough, I’m immediately worried about their lungs,” pediatrician Kellen Glinder told the station. Children are especially vulnerable to harm from wildfire smoke because their airways are still developing and they breathe more air relative to their body weight than adults do, according to the Centers for Disease Control and Prevention. However, Sacramento fire departments have stopped handing out the masks, with officials saying they can cause trouble breathing and are only necessary for those who need to work outside for a sustained amount of time. They urged everyone else stay indoors as much as possible. California education officials moved to help schools connect with the resources they need and to protect them from the funding they lose for every day a student is not in school. “The state Department of Education has been activated at the State Operations Center of the Governor’s Office of Emergency Services and is working closely with school leaders in the impacted counties to provide a range of supports,” state Superintendent Tom Torlakson said in a statement Thursday. “I want to thank school districts for acting to protect educators and students, and to let them know that the California Department of Education will assist them in any way that we can. Safety must come first for students, teachers, and staff,” Torlakson said in a follow-up statement released Friday. Schools closed because of the fires can also apply for waivers so that they do not lose state funding based on the lost instructional time or decreased attendance. Torlakson encouraged districts where the air is toxic to continue keeping students indoors when they can. The smoke’s origin, the Camp Fire, destroyed more than 10,360 homes in and around Paradise in Butte County. The blaze also ravaged the school district there, leaving just one of Paradise Unified’s nine schools unharmed, EdSource reported. Yet while Paradise High School still stands, its future is uncertain, as many of its students and staff are now homeless, scattered wherever they could find housing. Students from the Class of 2019 aren’t sure if they’ll be able to graduate. More than 4,200 of the district’s students are now homeless, as are many of their teachers and school board members, according to EdSource. Butte County Superintendent Tim Taylor, who oversees Paradise schools, has set up a relief fund that will provide some students in the district with laptops they can use to connect with their teachers and complete assignments. A law known as McKinney-Vento Homeless Assistance Act requires public schools to accept students who are homeless even if they don’t have their school or immunization records or proof of residency. Other Butte County districts are expected to reopen Dec. 3. So far the Camp Fire has killed 77 people, and 933 people are missing, NPR reported Monday. Rain is in the Bay Area forecast for Tuesday and Wednesday, which is expected to clear the air and could help suppress the fire. Officials are working to get students in Butte County, where the fire is still burning, back to class. Taylor, the county superintendent, said portable classrooms are a possible solution to replace the damaged schools.